Cambrai Memorial to the "Missing"
Enoch Bywater was born in Beeston in April 1891 and baptised at Beeston Parish Church on 1 November 18992, the son of Edward William (b. 1860, Nottingham) and Elizabeth Bywater (b. c1859, Beeston, née Lees). Enoch was their seventh child, fourth son, part of a family that eventually included fifteen children, all but two surviving beyond childhood3. The name 'Enoch' was a traditional one in the family. His uncle, a younger brother of Edward William, born in Beeston in 1866, served in the Boer War with the Royal Army Medical Corps and again in the Great War, as a Corporal Cook with the 4th Light Horse Field Ambulance of the Australian Imperial Force4 before becoming a Chelsea Pensioner in his later years5. He was also the Great-Grandson of Enoch Jowett whose son, William Jowett fought in the Crimean War, received injuries from which he later died and is commemorated on the Crimean War memorial in Beeston6. His daughter Emma married Edward Bywater and they became the parents of Edward William. In 1901, the family, then including ten children, was living at 18 William Street, Beeston with Edward William working as an iron moulder7. By 1911, the family was living at 84 Lower Regent Street, Beeston8 with Edward William continuing to work as a moulder. Enoch, then aged 19, was working in the lace trade as a threader. The family later moved 18 Dagmar Grove, Beeston9 and was well known in Beeston for many years and descendants remain in the area. On 3 October 1914, at Lenton Parish Church, Enoch married Lily Berry, the daughter of Thomas, a skinner at the local tannery in Lenton and his wife Sarah Ann (née Coombes). Lily had worked as a cycle hand, presumable at the Raleigh factory10. Their son, Edward W, arrived shortly afterwards, followed by their daughter Lily, in July 191611. As Enoch's Army Service Record has not survived, we do not have a precise date when he enlisted in the Army but it is likely to have been in June 191612. By the end of 1915, over a million men had volunteered to serve but now the number coming forward was falling fast. The Derby Scheme, which was launched in the autumn of 1915, was designed to persuade single men to attest and be placed in the Reserve for later enlistment was only partially successful. There was, however, no letup in the numbers needed on the Western front and, despite its unpopularity, there was little option but to introduce conscription in January 1916, initially for single men aged 18-41. In May 1916, conscription was extended to married men and it appears the Enoch was included in this phase designed to find the required numbers. By this stage, there was no guarantee that a man could join his local regiment and, in the event, Enoch was directed to join 3rd Battalion North Staffordshire Rifles. However, at some point Enoch was transferred to 10th (Service) Battalion Rifle Brigade (Prince Consort's Own), one of 28 battalions that the Regiment formed during the war, in addition to its pre-war establishment. The Rifle Brigade was first raised in 1800 as an elite Corps of Riflemen trained to be deployed as individual soldiers to hit specific targets, an unorthodox tactic at the time when the mass volley was the convention. In the Great War, however, the Brigade was deployed as infantry in the trenches. It was to lose 11,575 men killed during the course of the war and was awarded 52 battle honours including 10 Victoria Crosses13. 10th Battalion had originally landed in France in July 1915 as part of 59th Brigade of the 20th Division and was involved in various actions on the Western Front throughout the remainder of 1915 and throughout 1916. It is likely that Enoch, having completed his basic and specialist training, joined them in early 1917 to take part, with the Battalion. in advance to the Hindenburg Line and several phases of the Third Battle of Ypres (Passchendaele) - including the Battle of Langemarck in August 1917, the Battle of the Menin Road Ridge and the Battle of Polygon Wood in September 191714. At some point he was promoted to the rank of Lance Corporal. In November, the Battalion took part on the Cambrai operation, described by Sir Douglas Haig as the gaining of a 'local success by a sudden attack at a point where the enemy did not expect it' and to some extent it succeeded. The proposed method of assault was new, with no preliminary artillery bombardment. Instead, tanks were be used to break through the German wire, with the infantry following under the cover of smoke barrages. The attack began early in the morning of 20 November 1917 and initial advances were remarkable. However, by 22 November, a halt was called for rest and reorganisation, allowing the Germans to reinforce. From 23 to 28 November, the fighting was concentrated almost entirely around Bourlon Wood and by 29 November, it was clear that the Germans were ready for a major counter attack. During the fierce fighting of the next five days, much of the ground gained in the initial days of the attack was lost. For the Allies, the results of the battle were ultimately disappointing but valuable lessons were learnt about new strategies and tactical approaches to fighting. The Germans had also discovered that their fixed lines of defence, no matter how well prepared, were vulnerable15. The counter attack by the enemy on the 30th November caught 10th Battalion by surprise and became a total disaster. The resulting confusion, and the fact that all its headquarters staff became casualties, meant that the record of events were uncertain and its War Diary records in particular had to be put together after things had settled down several days later. At 8am enemy shelling was reported on the front line and enemy aircraft appeared although these events didn't, at first appear to indicate an attack. However, with the companies in the act of standing to, the enemy through on the right flank and the men were forced to fall back, suffering severe casualties by machine gun fire from very many low-flying hostile aircraft. Eventually, having withdrawn the battalion was able to take a stand but the cost had been very high, causing it to be disbanded in February 191816. Sadly, Lance Corporal Bywater's body was never found and he is commemorated on the CambraI Memorial which stands on a terrace at one end of the Louverval Military Cemetery, which is situated south of Louverval a small village on the north side of the N30, Bapaume to Cambrai road, 13 kilometres north-east of Bapaume and 16 kilometres south-west of Cambrai. The Memorial commemorates more than 7,000 servicemen of the United Kingdom and South Africa who died in the Battle of Cambrai in November and December 1917 and whose graves are not known. It was designed by H Chalton Bradshaw with sculpture by C S Jagger. The chateau at Louverval, was taken by the 56th Australian Infantry Battalion at dawn on 2 April 1917. The hamlet stayed in Allied hands until the 51st (Highland) Division was driven from it on 21 March 1918 during the great German advance, and it was retaken in the following September. Parts of Rows B and C of the cemetery were made between April and December 1917 and in 1927, graves were brought in from Louverval Chateau Cemetery, which had been begun by German troops in March 1918 and used by Commonwealth forces in September and October 1918. 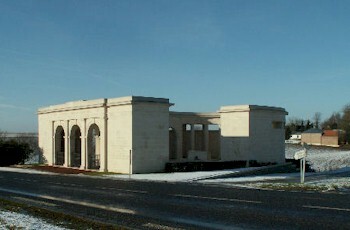 The cemetery now contains 124 First World War burials17. Enoch's younger brother, John, served with the York and Lancaster Regiment and was killed in the Battle of the Somme on 1 July 1916 His cousin, William Henry Bywater, who was serving with the Kings Own Yorkshire Light Infantry was also killed on this first day of the Somme battle. Enoch is also remembered on the War Memorial at Sherwin Road/Church Street, Lenton, Nottingham. Towards the end of 1920, Lily Bywater, Enoch's widow, married John William Wharmby. She died in Nottingham in 1966, aged 7321. 4First World War Embarkation Roll at www.awm.gov.au/collection/R1809443. 5Royal Hospital Chelsea Pensioner Soldier Service Records, 1760-1920 at ancestry.com 6The story of William Jowett and a transcript of the account of his experience in the Crimea, that he wrote, may be accessed here. 9This address was given by his sister Sarah when she began working at Beeston Foundry as a core maker in September 1916 and in his brother John's Army Service Record. Their parents continued to live there after the war. 10In 1911, the Berry family were at 19 Priory Street, Old Lenton, Nottingham - Lenton, 1911 Census, Piece 20491 RD430 SD1 ED2 Sched 125. 11Their son, Edward W, was born in the Nottingham Registration District in Q4/1914 (ref Q4/195). Their daughter Lily was also born there on 13 July 1916. 12The year and month of his enlistment has been calculated based on the amount of his War Gratuity. 13This outline of the origins of the Rifle Brigade is based on that on the Forces War Records website at www.forces-war-records.co.uk/units/297/rifle-brigade. 16This account is based on the Battalion's war diary - available at ancestry.com. 18Lance Corporal Bywater's medal awards are recorded in the Medal Rolls and on his Medal Card, available on ancestry.com. In this and other records relating to his war service, his name is spelled 'Enock'. 19Army Registers of Soldiers' Effects, 1901-1929, available on ancestry.com. 20John's memorial page may be seen here and William Henry's here. 21Their marriage was recorded in Nottingham Registration District in Q4/1920 (Ref 7b 984. Lily's death was recorded in Nottingham Registration District in Q3/1966 (Ref 3c 320).